We offer a wet cleaning service to complement our drycleaning service. Our wet cleaning system is the innovative alternative to drycleaning which is greener and more environmentally friendlier. Wet cleaning uses both water and natural solvents. We offer outstanding knowledge of both dry and wet cleaning and can provide an excellent service in both. 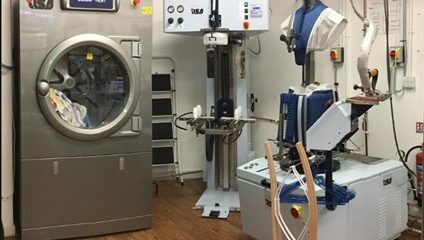 The wet cleaning process is carefully computer controlled and we use special dryers, safe detergents and non-toxic spot removers which makes this method environmentally friendly. 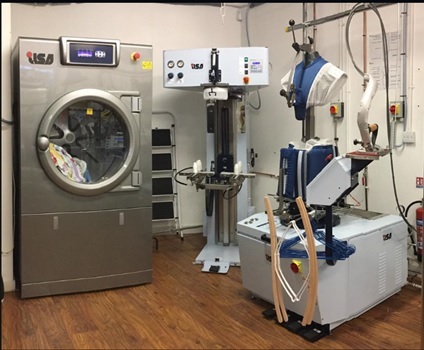 Our wet cleaning machine allows us to safely and efficiently clean a wide variety of garments in water. We use a jacket former as a jacket needs to be shaped before it is pressed, and special attention is given to the lapels and vents. Using our specialised jacket machine means your garment is pre-shaped before being pressed for perfect results every time. We also use a special trouser machine to form your trousers before being pressed to make sure the best results are achieved. Our wet cleaning service offers the same specialist and high-quality service that our drycleaning and other services provide to ensure customer satisfaction.